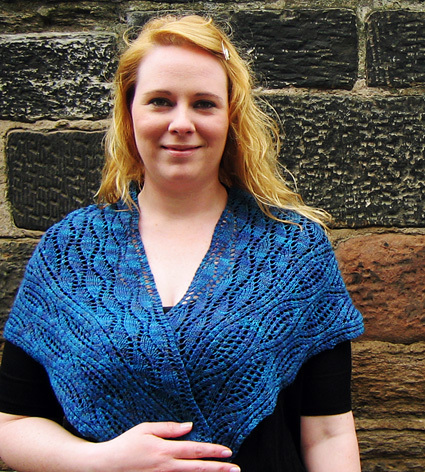 New Knitty is up! What is Knitty you ask? Really?! Knitty is a great free online magazine full of patterns and some great features and articles. This issue has some fabulous Zauberball socks and a new shawl pattern from Emily Wessel, the Estuary Shawl. The socks are made with a construction I’ve never seen before, which is saying a lot since there are so very many sock constructions! 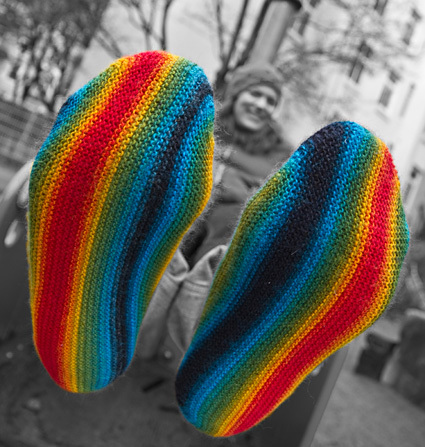 The Longitudinal Socks are made from side to side, utilizing the rainbow-stripe fabulousness that is Zauberball sock yarn! Estuary Shawl: “An estuary is a fertile place, a junction between riverine and ocean habitats, where the mixing of fresh and salt water creates a gradated ecosystem which nurtures thousands of species”. Doesn’t that intro say it all? A pretty shawl that draws from the beautiful land/water form of it’s namesake. Socks are such a popular knitting item at UY we have an entire wall of sock yarn. We have a shelf of sock knitting books. There is a bootcamp class dedicated to teaching socks in an evening (or part of an afternoon). They are just so popular! There are a lot of things to like about socks, not the least of which is the fact that the pattern possibilities are endless. Once you know the size of your foot and the heel turn that really works for you you can knit a sock up in any which way. There are also an endless supply of sock patterns online, as well as many sock books to choose from. The other great thing is that the colour options are fabulous. Socks are usually hidden under your shoes or pants (unless you’re a socks and sandals kind of person) so you can be colour adventurous! Before leaving us for San Fran Sarah was knitting up some charming socks that inspired me to get back to my own pairs on the go. The first pair she knit up in the ever popular Zauberball. This yarn is a lot of fun for socks, it doesn’t really stripe so much as it moves from one colour or shade to another, making it kind of exciting to knit with. What colour will come up next?! It sounds silly but give it a try and you’ll see what I mean. The only trouble with striping yarns in general is that you usually get more a fraternal twin sock than an identical one. This doesn’t phase me at all but it can be kind of a pain to get your socks to match, not impossible, just more difficult than with a solid yarn. The pattern for these lovely socks is Circle Socks, a free pattern on Ravelry. Next is a pair of pretty purple socks in SweetGeorgia’s Cashluxe yarn. We have a couple of sock yarns with a hint of cashmere in them and I am always pleased with the feet treat they offer. I love a nice soft sock yarn that is still washable, it’s the best of all worlds! 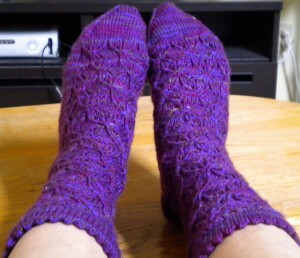 This colourway is Violet Hill and the pattern is Esther Socks (another Ravelry freebie). The pattern is just beautiful, it is a pretty embossed leafy pattern that is to dye for! So pick up some sock needles and hit the sock wall for some lovely portable knitting!